Ziprasidone (marketed as Geodon, Zeldox by Pfizer) was the fifth atypical antipsychotic to gain FDA approval (February 2001). In the United States, Ziprasidone is Food and Drug Administration (FDA) approved for the treatment of schizophrenia, and the intramuscular injection form of ziprasidone is approved for acute agitation in schizophrenic patients. Ziprasidone has also received approval for acute treatment of mania and mixed states associated with bipolar disorder. The brand name Geodon has been suggested to bring to mind the phrase 'down (don) to earth (geo)' referring to the goals of the medication. The oral form of ziprasidone is the hydrochloride salt, ziprasidone hydrochloride. The intramuscular form, on the other hand, is the mesylate salt, ziprasidone mesylate trihydrate, and is provided as a lyophilized powder. Geodon was one of four drugs which Pfizer in 2009 pleaded guilty to misbranding "with the intent to defraud or mislead". Pfizer agreed to pay $2.3 billion (£1.4 billion) in settlement, and entered a corporate integrity agreement. Pfizer was found to have illegally promoted four of its drugs for use in conditions that had not been approved by the FDA. Ziprasidone has a high affinity for dopamine, serotonin, and alpha-adrenergic receptors and a moderate affinity for histamine receptors, where it is believed to act as an antagonist. Ziprasidone also displays some inhibition of synaptic reuptake of serotonin and norepinephrine, although the clinical significance of this is unknown. The mechanism of action of ziprasidone is unknown. However it has been theorized that its antipsychotic activity is mediated primarily by antagonism at dopamine receptors, specifically D2. Serotonin agonism may also play a role in the effectiveness of ziprasidone, but the significance of 5-HT2A antagonism is debated among researchers. Ziprasidone has perhaps the most selective affinity for 5-HT2A receptors relative to D2 and 5-HT2C receptors of any neuroleptic. Antagonism at histaminic and alpha adrenergic receptors likely explains some of the side effects of ziprasidone, such as sedation and orthostasis. The systemic bioavailability of ziprasidone administered intramuscularly is 100%, or 60%, administered orally with food. After a single dose intramuscular administration, the peak serum concentration typically occurs at about 60 minutes after the dose is administered, or earlier. Steady state plasma concentrations are achieved within one to three days. The mean half-life ranges from two to five hours. Exposure increases in a dose-related manner and following three days of intramuscular dosing, little accumulation is observed. Ziprasidone absorption is not optimally achieved when administered without food. Without a meal preceding dose, the bioavailability of the drug is reduced by approximately 50%. Ziprasidone is hepatically metabolized by aldehyde oxidase; minor metabolism occurs via cytochrome P450 3A4 (CYP3A4). Medications that induce (e.g. carbamazepine) or inhibit (e.g. ketoconazole) CYP3A4 have been shown to decrease and increase, respectively, blood levels of ziprasidone. Ziprasidone received a black box warning due to increased mortality in elderly patients with dementia-related psychosis. It also slightly increases the QTc interval in some patients and increases the risk of a potentially lethal type of heart arrythmia known as torsades de pointes. Ziprasidone should be used cautiously in patients taking other medications likely to interact with ziprasidone or increase the QTc interval. Ziprasidone is known to cause activation into mania in some bipolar patients. This medication can cause birth defects, according to animal studies, although this side effect has not been confirmed in humans. Adverse events reported for ziprasidone include severe chest pains, sedation, insomnia, orthostasis, life-threatening neuroleptic malignant syndrome, akathisia, and the development of permanent neurological disorder tardive dyskinesia. Rarely, temporary speech disorders may result. Recently, the FDA required the manufacturers of some atypical antipsychotics include a warning about the risk of hyperglycemia and Type II diabetes with atypical antipsychotics. Some evidence suggests that ziprasidone may not be as bad as some of the other atypical antipsychotics (namely, olanzapine (Zyprexa)) at causing insulin resistance and weight gain. In fact, in a trial of long term therapy with ziprasidone, overweight patients (BMI > 27) actually had a mean weight loss overall. Ziprasidone, though, is not a weight loss drug. The weight loss reflected in this study on ziprasidone was really reflective of patients who had gained weight on other antipsychotics who were now trending back toward their baseline. According to the manufacturer insert, ziprasidone caused an average weight gain of 2.2 kg (4.8 lbs) (which is significantly lower than other atypicals clozapine and olanzapine). In addition to its antipsychotic use, ziprasidone is sometimes prescribed for the treatment of tic disorders. A small study has supported the efficacy of this use. ^ "Pfizer agrees record fraud fine". BBC News. British Broadcasting Corporation. 2 September 2009. http://news.bbc.co.uk/2/hi/business/8234533.stm. ^ a b Nemeroff CB, Lieberman JA, Weiden PJ, Harvey PD, Newcomer JW, Schatzberg AF, Kilts CD, Daniel DG. (November 2005). "From clinical research to clinical practice: a 4-year review of ziprasidone". CNS Spectr 10 (11 Suppl 17): 1-20. ^ Tatsumi M, Jansen K, Blakely RD, Richelson E (March 1999). "Pharmacological profile of neuroleptics at human monoamine transporters". Eur J Pharmacol 368 (2-3): 277-283. ^ LÃ¼llmann, Heinz; Lutz Hein, Klaus Mohr (2006). Pharmakologie und Toxikologie. Thieme. ^ Marek GJ, Carpenter LL, McDougle CJ, Price LH (2003). "Synergistic action of 5-HT2A antagonists and selective serotonin reuptake inhibitors in neuropsychiatric disorders". Neuropsychopharmacology 28 (2): 402-12. http://www.nature.com/npp/journal/v28/n2/full/1300057a.html. ^ Seeger TF, Seymour PA, Schmidt AW, Zorn SH, Schulz DW, Lebel LA, McLean S, Guanowsky V, Howard HR, Lowe JA (October 1995). 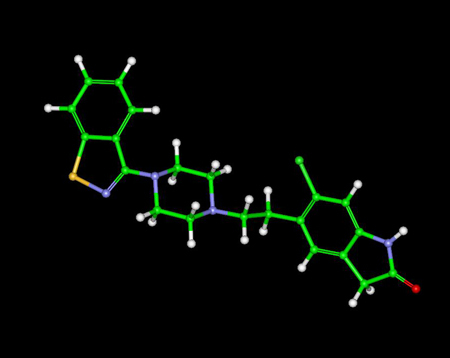 "Ziprasidone (CP-88,059): a new antipsychotic with combined dopamine and serotonin receptor antagonist activity". J Pharmacol Exp Ther 275 (1): 101-13. ^ a b c d "Geodon Prescribing Information". Pfizer, Inc.. http://www.pfizer.com/pfizer/download/uspi_geodon.pdf. Retrieved 2009-01-26. ^ Miceli JJ, Glue P, Alderman J, Wilner K (2007). "The effect of food on the absorption of oral ziprasidone". Psychopharmacol Bull 40 (3): 58-68. ^ Sandson NB, Armstrong SC, Cozza KL (2005). "An overview of psychotropic drug-drug interactions". Psychosomatics 46 (5): 464-94. ^ Miceli JJ, Anziano RJ, Robarge L, Hansen RA, Laurent A (2000). "The effect of carbamazepine on the steady-state pharmacokinetics of ziprasidone in healthy volunteers". Br J Clin Pharmacol 49 Suppl 1: 65S-70S. ^ Miceli JJ, Smith M, Robarge L, Morse T, Laurent A (2000). "The effects of ketoconazole on ziprasidone pharmacokinetics--a placebo-controlled crossover study in healthy volunteers". Br J Clin Pharmacol 49 Suppl 1: 71S-6S. ^ "Geodon (ziprasidone HCl) Dear Healthcare Professional Letter, Mar 2002". MedWatch. Food and Drug Administration. http://www.fda.gov/Safety/MedWatch/SafetyInformation/SafetyAlertsforHumanMedicalProducts/ucm170899.htm. Retrieved 2009-08-03. ^ CF Baldassano, C Ballas, SM Datto, D Kim, L Littman, J O'Reardon, MA Rynn (2003). "Ziprasidone-associated mania: a case series and review of the mechanism". Bipolar Disord 5 (1): 72-75. ^ Keating AM, Aoun SL, Dean CE (March/April 2005). "Ziprasidone-associated mania: a review and report of 2 additional cases.". Clin Neuropharmacol 28 (2): 83-86. ^ Davis R, Risch SC (April 2002). "Ziprasidone induction of hypomania in depression?". Am J Psychiatry 159 (4): 673-674. ^ Tschoner A, Engl J, Rettenbacher M, Edlinger M, Kaser S, Tatarczyk T, Effenberger M, Patsch JR, Fleischhacker WW, Ebenbichler CF (January 2009). "Effects of six second generation antipsychotics on body weight and metabolism - risk assessment and results from a prospective study". Pharmacopsychiatry 42 (1): 29-34. ^ Guo JJ, Keck PE, Corey-Lisle PK, Li H, Jiang D, Jang R, L'Italien GJ (January 2007). "Risk of diabetes mellitus associated with atypical antipsychotic use among Medicaid patients with bipolar disorder: a nested case-control study". Pharmacotherapy 27 (1): 27-35. ^ Sacher J, Mossaheb N, Spindelegger C, Klein N, Geiss-Granadia T, Sauermann R, Lackner E, Joukhadar C, Muller M, Kasper S (June 2008). "Effects of olanzapine and ziprasidone on glucose tolerance in healthy volunteers". Neuropsychopharmacology 33 (7): 1633-41. ^ Newcomer JW (2005). "Second-generation (atypical) antipsychotics and metabolic effects: a comprehensive literature review". CNS Drugs 19 Suppl 1: 1-93. ^ Sallee FR, Kurlan R, Goetz CG, Singer H, Scahill L, Law G, Dittman VM, Chappell PB (March 2000). "Ziprasidone treatment of children and adolescents with Tourette's syndrome: a pilot study". J Am Acad Child Adolesc Psychiatry 39 (3): 292-299.